The Tear Collector by Patrick Jones. Walker Books // Hardcover // 272 pages. This book was not my cup of tea, at all. The idea that vampires need tears to survive instead of blood was really intriguing, but unfortunately I felt the plot was the same event over and over again. Cass would find someone who needed to cry, manipulate them into shedding their tears, and then leave them alone. Even when she seemed to care about the teen, I couldn’t believe her. And when she started to have a relationship, I really didn’t believe her. Her family villain was over the top and I almost found myself rolling my eyes at his antics. The important thing about this review is that while I didn’t like it, I suspect the reason is twofold. 1. I was expecting a paranormal story and instead got a lot of high school drama and cliques. 2. I am an adult and high school drama honestly does not interest me. I was there, I got teased as a teen, I did some teasing as a teen and I really don’t feel like reliving that particular part of my life. So, no, I didn’t like this book. I still think it has a place in YA literature. My teens will probably react surprised when they find out it’s not as paranormal as they might expect, but where I wasn’t interested (the high school drama) — they probably will be. 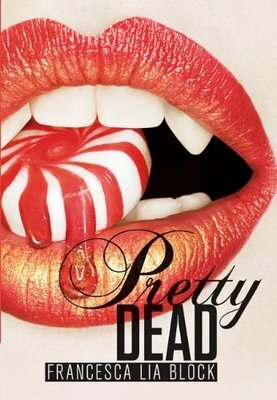 Pretty Dead by Francesca Lia Block. HarperTeen // Hardcover // 208 pages. Charlotte’s not your typical vampire. She doesn’t spend her nights fun and blood-filled, instead she goes to school like a normal teenage girl. But what Charlotte wants makes her truly unique — her mortality back. She surrounds herself with friends, but her friends keep fading away. When Emily commits suicide, Charlotte finds her world is changing all over again. She’s suddenly breaking nails, feeling emotions again…like she used to when she was a human. I’m still not exactly sure what I thought about this one. I liked the idea of a vampire wanting to be human, but Charlotte mostly sat around and moped about it. She also didn’t have the personality that I expected such an older vampire to have — she was very much frozen at about 16 in terms of her maturity. The supporting characters are pretty flat and I guessed the twist about twenty pages into the book. I also felt like some of the mythology was left up in the air, I still don’t know exactly why Charlotte was reverting back to her human tendencies. The cover is misleading, which bothers me. The cover is what jumped out at me and convinced me to purchase the book. It’s a beautiful cover, but not exactly right for the story. It comes across as almost a vampire-Gossip Girl blend, and while you will find designer clothes in Charlotte’s wardrobe, she’s definitely not as scandalous as Serena and Blair. I liked the quickness of the story, I liked the conclusion (satisfying, without a long, drawn-out possibility of a sequel), and I think the book will do well in libraries if you book talk it. Blood Promise by Richelle Mead. Razorbill // Hardcover // 512 pages. Rose Hathaway is about to do the hardest thing that she’s ever done — kill the man she loves. After Dimitri was turned into a Strigoi, Rose sets out on a long journey to Russia to find him again. Meanwhile, Lissa remains at St. Vladimir’s Academy without Rose and there’s something amiss with the Academy and Tatiana’s visit. With the two friends apart for the first time, how will they manage? We’re going for a full out spoilers review here. It’s been a month. Let’s talk about the things I didn’t like quickly. The sudden appearance of Alchemists. Would have much preferred Rose to run into some graduates of the Academy to help her. Hated that Lissa stayed behind. (I understand it, but it doesn’t mean I have to like it. I mean, if that was my best friend and she had gone through what Rose had gone through, there would be absolutely no way that she’d leave me behind.) Lack of Christian. Some time problems/issues. Recapping at the beginning of the book didn’t work for me. I remembered “Shadow Kiss” just fine. The spirit battle may be my favorite thing ever from the whole series. You have no idea the amount of gleeful-squeeing that came out of my mouth during that scene. I love Dimitri’s family — they are such perfect echoes of his personality and just a great thing to see (especially since I was missing Dimitri something fierce). Rose’s time spent with Dimitri-Strigoi (because he was NOT Dimitri) fit in the world and while it might have been hard to read/stomach, I liked it. I think that it really proved that Dimitri wasn’t himself, that there wasn’t some glimmer of good in him. It made readers understand Rose “killing” him. Which brings up to the twist, the fairy tale, the ring, the possibility that Dimitri may be okay. Yeah, I thought it was a bit eh-eh. Yeah, I saw it coming. But let’s be realistic here, no one wants to see Harry Potter die at the end of book seven. Just like no one wants to see Dimitri gone and Rose miserable. I really enjoyed this book. View it as part of the series, part of the journey. And enjoy the ride. Please be aware, this is the sequel to Evernight, and I wouldn’t want anyone to get spoiled of the events in the first book. Turn back now if you haven’t read it! Okay, I think we’re safe here. After last year, Bianca is returning to Evernight Academy while Lucas is still out there in the world, working for Black Cross, hunting down vampires…hunting down Bianca’s family and friends. Bianca and Lucas continue their romance, meeting up as often as possible, using friends to pass along notes. That is, until Balthazar catches them. Through a series of events, Bianca and Balthazar form an alliance. Bianca can continue to see Lucas and Balthazar will get her off-campus safely, only if Bianca helps Balthazar find his sister. This book threw me for a loop I wasn’t prepared for all over again. During “Evernight”, I thought for sure Bianca was a student at a vampire boarding school and was a vampire, then convinced myself she wasn’t, and then found out she was. In “Stargazer”, we delve more into the mythology of Evernight Academy and Bianca’s creation (she’s one of the few vampire children in the world). I’m intrigued with the explanation that Claudia Gray gives up about Bianca, but I’m going to have to wait until the series concludes before deciding how I feel about it. I missed a lot of the supporting characters in this book, particularly Bianca’s roommate, since Balthazar took more of a center-stage role and I feel less connected to him. Gray has mentioned inklings about an all Balthazar book, and I think it would be a great resource for helping me to relate to and understand the character. The Evernight series has improved for me, and I am looking forward to the next volume, early in 2010. Absolutely recommended for fans of Twilight; this book series is better written and I’m much happier to see a stronger female figure in Bianca. Carpe Corpus by Rachel Caine. As the sixth book in the series, you come to expect a certain level of consistency and quality — “Carpe Corpus” does not disappoint. Claire has grown into a steady heroine, able to make her own decisions and to live with the consequences. The other members of the Glass House continue to surprise me and to work as characters. The vampires are still mystifying and intriguing — not to mention new characters like Ada, the vampire computer! I thought that was pretty innovative and I definitely did not see it coming. Caine’s writing is easy to read and her books are hard to put down. The series was originally planned as a six book set and the end of this novel provides a lot of closure. The plot wraps up nicely without a perfect bow on it — there are still some loose ends that may resurface in the next books (the series has been renewed to nine books!). This is the first book without a cliffhanger ending and for once, I’m thankful for it. Now it will be much easier to wait for the seventh book, “Fade Out” due in November. One of my very favorite vampire series — it’s clever, well-written, and doesn’t rely on the typical vampire cliches to get readers hooked. Of course, this book is an easy sell to fans of Stephenie Meyer’s “Twilight” series, but the story here is meatier. At the end of the final battle, there is loss and real danger. Claire and company may walk away from the battle, but they definitely are changed because of the outcome. A fantastic read, worthy of the recognition the series is finally getting.